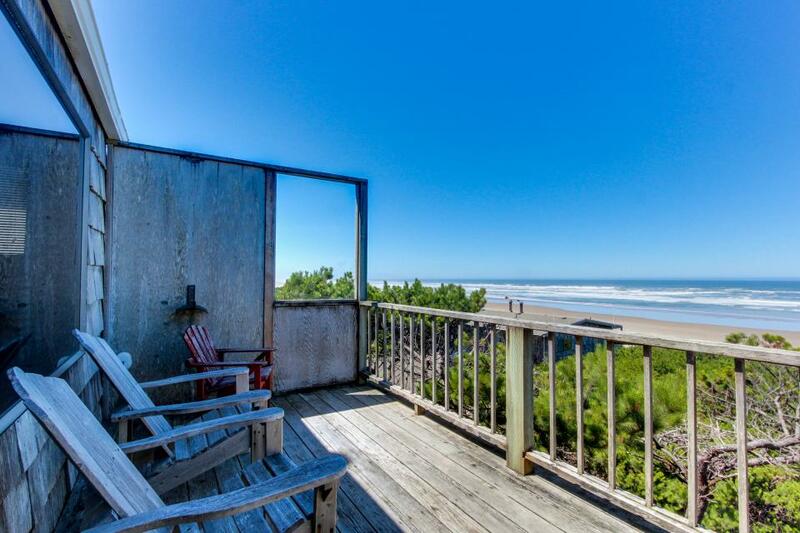 This oceanfront Oregon Coast getaway is the perfect spot to call home during your next Waldport retreat! Walk right to six miles of beautiful sandy beach, or just soak up the views of the Pacific from your own private oceanfront deck. Part of the idyllic Cape Cod Cottages community, this pet-friendly Oregon Coast rental has a large living area with a wood-burning fireplace, along with a full kitchen and dining area for six. The cottage has two bedrooms, one with a queen bed on the lower level and one with two double beds upstairs. There's also a full bath with a shower only (no tub), and complimentary WiFi as well. Up to six guests are welcome, along with two dogs - a $10 per day, per dog fee does apply, with a $40 minimum per stay. Right by the beach and just south of the charming fishing village of Waldport: this rustic Oregon Coast getaway offers everything you need for a relaxing retreat!